The man with the hair we're supposed to ignore and the woman with the eyes we can't ignore have teamed up to have a phone conversation that we wish we could ignore. Donand Trump joined Michele Bachmann on a phone call to promote the Minnesota Congresswoman's Presidential campaign on Monday, and, as you might expect, it was brought to you by the letters W, T, and F.
The "tele town hall," which is almost as terrible a neologism as "webinar," was held as a means for Bachmann to showcase, I don't know, the fact that she has a friend with a swimming pool. Trump's participation can be explained by the fact that he's Donald Motherfucking Trump, and if people don't pay attention to him, he'll die or start crying into his piles of money. Bachmann's camp claims that 200,000 bored Americans took some valuable time out of their very busy abortion clinic picketing and racist Youtube video-making schedules to listen to the two talk on the phone and later field questions. The whole event was quite the to-do. 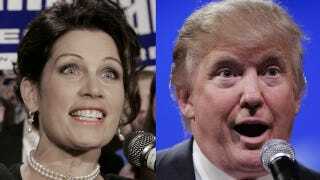 Bachmann acted like a contestant on The Apprentice for the majority of the call, addressing the businessman as "Mr. Trump" while he called her "Michele." And is it any wonder? Donald Trump is a wonderful, wonderful, wonderful Oompa Loompa sent down from heaven to fix America using sternness and hotels. But before you say, "Well golly gee whillickers, if that nice, honest Trump boy says I should support that lady from Minnesota, why then by gum, I'll guess I'll do it," hold up; he's not exactly "endorsing" Bachmann just yet. As you all know, he's an extremely busy man and he is on this call tonight because he is recognized as one of our nation's leaders understanding the economy and job creation. He is not on the call this evening because he's endorsing my candidacy for the presidency. He is on the call because he's admired, he's respected, he's known all over the world as a man who understands the economy. Trump, who has run various business ventures that have declared bankruptcy four times, had some self-aggrandizing crap to say as well. I was No. 1 in the polls when I left the race. I was so disappointed in the mistakes that the Republican Party was making. I'm a Republican, and when I left the race, as Michele will tell you, I was leading in the polls and I couldn't understand why somebody didn't pick up what I was saying about China and OPEC, and that's why I was leading, not just the birth certificate, which I'm very proud of. I got this guy to do something he didn't want to do, and someone should continue to analyze that whole deal, by the way. The President released his long form birth certificate on April 27 of this year, just days before a secret raid on Osama bin Laden's Pakistan compound. While Trump was whining about long form birth certificates, the President and his advisers were planning a high risk maneuver designed to take out the man behind the September 11th attacks. Trump was also far from "number 1 in the polls;" according to Politico, in early May, he dropped to 5th place in the Republican field. By the time he dropped out of the race, the percentage of voters who claimed they'd vote for Trump in the Republican primary fell to the single digits. But whatever! If a shouty white man is saying it, loudly, then it must be true! The call went on for about an hour and a half, but Trump was off the phone in an hour after several prolonged minutes of barking.